A struggling electric utility asked the Department of Energy today to offer an emergency lifeline for coal and nuclear power plants in the eastern United States. 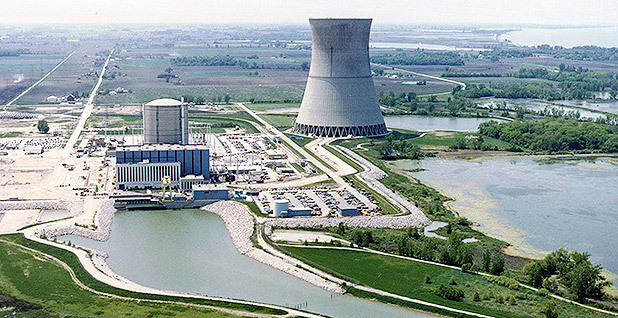 FirstEnergy Corp. requested that DOE use its authority under Section 202(c) of the Federal Power Act to direct PJM Interconnection — which oversees grid operations in 13 states and the District of Columbia — to negotiate contracts with certain plants and compensate their owners "for the full benefits they provide to energy markets and the public at large, including fuel security and diversity." The company's request comes a day after it announced plans to close its three nuclear plants — two in Ohio and one in Pennsylvania — in the next three years. The application asks that the order apply to all plants within PJM's footprint that maintain a 25-day supply of fuel on-site, not just those belonging to FirstEnergy, arguing that such an action is needed to maintain the "stability of the grid." FirstEnergy wants the order to last four years and apply to around 85 plants in Ohio, Pennsylvania, Virginia and other nearby states. "Such generating facilities provide significant benefits to energy markets and the public at large, including fuel security and diversity, but receive no reliable cost support and, instead, must rely on PJM's power markets which fail to compensate these generators for the full value of the benefits that they provide," the application says. Donald Schneider, president of FirstEnergy Solutions, the generation subsidiary of FirstEnergy, said in a statement, "PJM has demonstrated little urgency to remedy this problem any time soon — so immediate action by the Secretary is needed to alleviate the present emergency." DOE spokeswoman Shaylyn Hynes said the department had received the 202(c) application and will go through its "standard review process." The move follows the January failure of a DOE proposal — influenced in part by FirstEnergy — to direct the Federal Energy Regulatory Commission to change electricity market rules in some regions to compensate coal and nuclear plants. The idea was to ensure that electric grid resilience would be maintained. FERC rejected the proposal, which would have led to compensation for plants with 90 days of fuel on-site. The commission failed to find imminent problems with grid reliability and has instead begun its own study of resilience. It's not the first time Energy Secretary Rick Perry and President Trump have been asked to use the 202(c) authority to save FirstEnergy plants. Coal industry executive Bob Murray claimed last year that DOE had denied several demands from Trump to use that authority (E&E News PM, Aug. 22, 2017). Last month, DOE denied reports that Perry was considering using the authority to support FirstEnergy, saying a report from Bloomberg was based on "false information." DOE has used the authority occasionally in the past, including during the Trump administration, but typically has limited orders to individual plants or to transmission lines. Using it to keep coal and nuclear plants in PJM open would likely lead to legal challenges. "There is nothing in 202(c) that speaks to issuing an order to compensate plant owners for the full benefits they provide to energy markets, as FirstEnergy has stated," said Joel Eisen, an energy law professor at the University of Richmond. "That's not at all what 202(c) is designed for. By its plain terms, it speaks to system emergencies and not situations where owners receive less than full compensation." Any party affected adversely by the decision could challenge it as a "final agency action" under the Administrative Procedure Act, he said. John Moore, who leads the Sustainable FERC project at the Natural Resources Defense Council, said there would be "swift and universal opposition" from a wide range of interest groups if DOE granted the request. FirstEnergy's application cites a DOE report released this week that suggested coal was vital to grid resilience during the "bomb cyclone" weather event in December and January (E&E News PM, March 27). Renewable energy advocates and others criticized the findings and framing of that report and said it represents a politicization of the national laboratories. While DOE has not given any indication of how it will respond to FirstEnergy's request, Perry used his official Twitter account to "like" a reporter's tweet about the news of the utility's application.